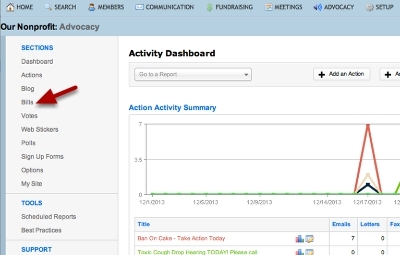 This tool allows you to setup and display legislation of interest in your advocacy site. You can add comments and indicate your position on the bill. 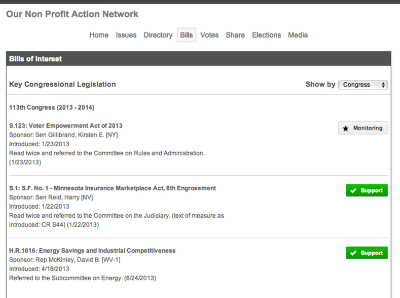 You can also view recent changes to a bill in your list. Bills are dynamic and updated in your system nightly. 1. Enter in the Type, Number, Congress (113th). 3. Public set to “Yes” to display it on your Action Site. Set Position. 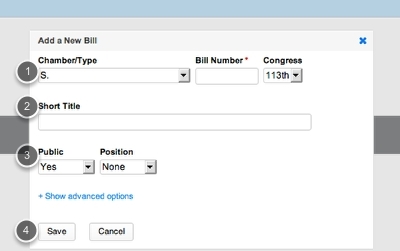 Click here for instructions on setting up a new Bill category.